Simple Audio expands range with Listen and Go Bluetooth speakers | What Hi-Fi? Simple Audio, the company behind the Roomplayer multiroom system, is branching out into wireless A2DP Bluetooth speakers with two new models: the £79 Go, a single portable speaker, and the £399 Listen stereo pair (above). The company says the new Bluetooth models "bring audiophile sound, designer styling and versatile connectivity to today's music lovers". 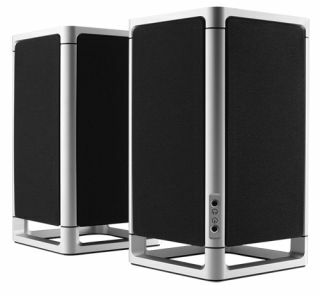 The Simple Audio Listen speakers incorporate a fully digital signal path, DSP (Digital Signal Processing), biamplification, Bluetooth, USB and line-in connections and a 40W per channel Class D digital amplifier. Sound is handled by a 1in ferro-fluid, silk-dome tweeter and 3in long-throw woofer with neodymium magnets. If you want more bass, there's a subwoofer output via RCA. You can control power, volume or mute via the capacitive controls on the speaker itself, or by using the infra-red remote control, which also handles play/pause, fast forward and review. For those who want a compact, portable Bluetooth speaker the Simple Audio Go will last for up to eight hours on a single charge, will fit easily into a bag or backpack and includes an integrated microphone for use as a speakerphone. Charging is via the USB port. Simple Audio says the Listen and Go Bluetooth speakers will be available later this month online and at selected retailers.